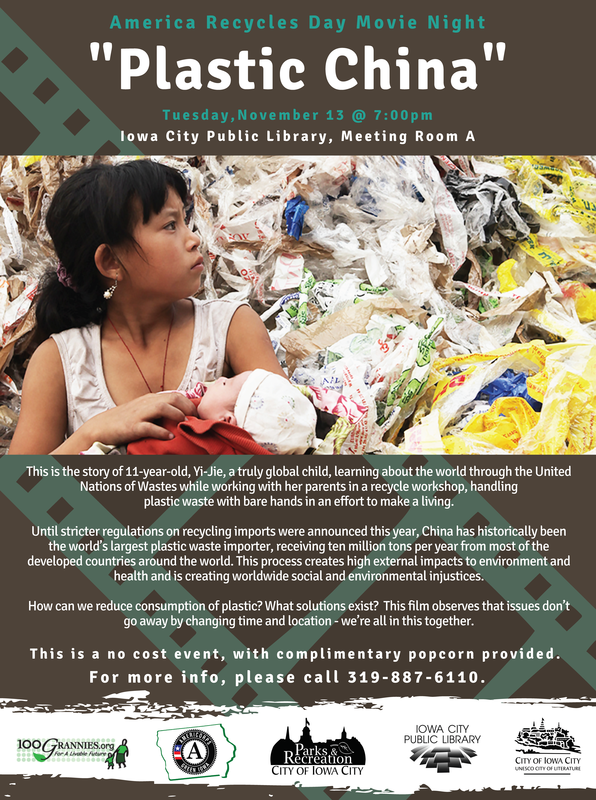 The film features the story of 11-year-old, Yi-Jie, a truly global child, learning about the world through the United Nations of Wastes while working with her parents in a recycle workshop, handling plastic waste with bare hands in an effort to make a living. Until stricter regulations on recycling imports were announced this year, China has historically been the world’s largest plastic waste importer, receiving ten million tons per year from most of the developed countries around the world. This process creates high external impacts to environment and health and is creating worldwide social and environmental injustices. How can we reduce consumption of plastic? What solutions exist? This film observes that issues don’t go away by changing time and location - we’re all in this together. For more information, contact Jane Wilch at 319-887-6110, or jane-wilch@iowa-city.org.